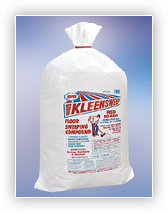 -The best formulation for use on floors that can be damaged by sand or grit. Red No-Base Kleensweep contains no sand. Ideal for all resilient floors like vinyl, glazed or unglazed tiles, hardwood floors & sealed concrete. Coverage for this product is approximately 20,000 sq. ft. per 100 pounds depending on application and floor surface.